Targeted killings: OK if Obama does it? Civil libertarians have worried that some of President Obama’s comparatively hawkish national security policies are silencing "liberal" Democrats who would have opposed such measures under President Bush or another Republican. Now there’s new evidence that Obama’s support for such policies isn’t just silencing them -- it’s winning them over. That’s the finding of new research by Brown University political scientist Michael Tesler, who studies what he calls the “racialization” of political issues in the age of Obama: mainly, the way voters’ attitudes about race can make them more or less likely to support policies once they know those policies are supported by Obama. Last year he made headlines with an American Journal of Political Science article about the way racial attitudes shaped opinions on the Affordable Care Act. Examining almost 20 years of polling going back to President Clinton’s efforts at healthcare reform, Tesler found that white voters were less likely to support reform under President Obama than under Clinton, with whites who exhibited the most conservative racial views (more on what that means below) the least likely to back the ACA. With African-Americans strong supporters of healthcare reform under both presidents, Tesler found that the racial divide between black and white opinions was 20 points greater in 2009-10 than it was during the Clinton-backed reform push in 1993-94. But Tesler learned something else interesting: White voters with liberal attitudes about race were more likely to support policies once they knew Obama backed them than they were without the president’s imprimatur, and so were African-Americans. That was true not only on the ACA, but on gay marriage, the stimulus bill and taxes, among other issues. Coincidentally I learned of Tesler’s research around the time the New York Times revealed the existence of a secret Obama “kill list” authorizing the use of drones and other measures to kill suspected terrorists last June. I wondered whether Obama supporters would be more likely to back such measures under this president than they would otherwise. I asked Tesler if he had any data on national security, and he promised to add some questions on those issues to his ongoing polling in partnership with the Internet polling group YouGov. In another coincidence, he sent me his findings the week after NBC’s Michael Isikoff revealed the unconvincing Office of Legal Counsel “white paper” summarizing the legal grounds for targeted assassination of American citizens. 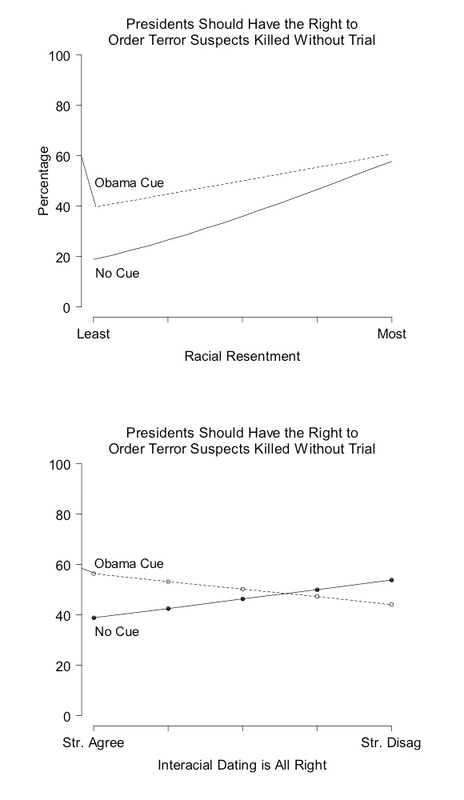 In a YouGov poll of 1,000 voters last August, Tesler found significantly more support for targeted killing of suspected terrorists among white “racial liberals” (i.e., those liberal on issues of race) and African-Americans when they were told that Obama supported such a policy than when they were not told it was the president’s policy. Only 27 percent of white racial liberals in a control group supported the targeted killing policy, but that jumped to 48 percent among such voters who were told Obama had conducted such targeted killings (which Tesler refers to as the “Obama cue”). He found a similar difference among African-Americans, but cautions that the sample size, of 60 in a control group and another 60 who were given the “Obama cue,” is small. “We can be pretty confident that blacks are more supportive when given the Obama cue, but not at all confident about how precisely large that difference is,” he told me via email. White “racial conservatives” were more likely than white racial liberals to support the targeted killing policy overall, and Obama’s support for it didn’t affect their opinion, as it had on issues like healthcare reform. You can see the results in the graphs below (more explanation comes later). Tesler’s first book, “Obama’s Race: The 2008 Election and the Dream of a Post-Racial America,” showed how deeply Americans’ racial attitudes were entwined with their views of our first black president. Co-authored with UCLA’s David O. Sears, the 2010 book showed how polls that revealed racial resentment could predict a huge divide in attitudes toward the president and his policies. As early as April 2009, Pew showed a gap of 70 percentage points in Obama’s approval rating between racial liberals and racial conservatives – a gap they hadn’t found in polling attitudes toward Obama’s five White House predecessors. Now Tesler’s at work on a second book he’s tentatively titled “Most-Racial: President Obama and the Growing Racialization of American Politics." So far most attention has been paid to Tesler’s research on white racial conservatives opposing policies they might have supported because Obama backs them. It’s been intriguing that it might work the opposite way too, as Tesler and other researchers found to be the case on gay marriage. The fact that Obama could make his national security policies more popular with liberals who might otherwise be skeptical of them is less heartening. When I’ve written about Tesler’s work before, I’ve gotten questions about how he defines “racial liberals” and “racial conservatives,” so it’s worth taking a moment to explain it. Much of his research relies on a battery of four questions used to measure “racial resentment:” Do blacks face the same obstacles to success as white immigrant groups did, meaning they should advance themselves without “special favors”? Would they achieve the same as whites if they only tried harder? Or have slavery and discrimination made it harder for black people to rise? And have they in fact gotten less help than they deserve in recent years? Solid majorities of white people answer yes to the first two questions and no to the last two; among African-Americans, opinions are roughly reversed. The white respondents who answer more like African-Americans – that is, they believe racial inequality is due to structural barriers, not merely a question of individual effort or merit -- are considered more “racially liberal.” They’re the ones Tesler has found are more pro-Obama, and pro-Obama policies – included targeted killings. Tesler also uses questions to tease out what he calls “old-fashioned racism” – a belief in black inferiority and support for social distance between the races. One reliable proxy for such attitudes is one’s opinion about interracial dating (at least among white people). Whites who were the most strongly supportive of interracial dating were also influenced by Obama’s support for targeted killing: They were about 20 percentage points more likely to support it when they knew it was Obama’s policy than when they didn’t. Again, there wasn’t much difference on the policy among whites who opposed interracial dating, regardless of whether they got the Obama cue (and since only 10 percent of whites strongly oppose interracial dating, the sample size was small). A few caveats about the research: Tesler simply asked about the president “killing suspected terrorists without trial.” He didn’t refer specifically to American citizens, or the precise operational details of the broader “kill list,” or the use of drones to do the killing. But Tesler’s polling research is widely respected, as is YouGov’s; Nate Silver found that YouGov polls performed “relatively well” in the run-up to the 2010 midterm elections, ahead of Rasmussen, CNN/Opinion Research and Marist College. YouGov is also one of the only outfits to conduct recent polling about public opinion on drones, and partnering with the Huffington Post, YouGov polls have found some interesting divergence from other polls on the overall issue of targeted killing. A widely cited Washington Post/ABC News poll from a year ago found that 83 percent of Americans approve of the Obama administration’s use of drones to kill terrorists, including 77 percent of liberal Democrats. However, that was before the Times’ revelation of the “kill list,” or Isikoff’s exposure of the white paper justifying the killing of American citizens suspected of terrorism. After the revelation of the kill list, Pew conducted a global survey about the use of drones, which found that Americans supported the policy 62-28, with Republicans at 74 percent and Democrats lower at 58 percent (Americans were the only national group polled who favored the policy). But Huffington Post/YouGov polling after Isikoff’s scoop found that while 56 percent of respondents support using drones against “high-level terrorist leaders,” only 13 percent think they should be used against “anyone suspected of being associated with a terrorist group.” And only 27 percent supported using drones "if there was a possibility of killing innocent people." Another 13 percent opposed the drone program entirely. Given that only a minority of those killed by drones to date are “high-level leaders” – the New American Foundation estimates it’s as low as 2 percent – Americans may be more skeptical of the policy the more they learn about it. Tesler’s research, though, suggests that their reaction may be informed by their support for the president, which is at least a little bit troubling. The U.S. is moving into uncharted political, military and moral territory with the use of drones, as well as expanded claims of presidential powers on targeted killings, on what seems to be a global battlefield in a time of endless war. Some of the very people who might be expected to raise objections to such moves are instead accepting them because they are made by Obama, and they like and trust him. That’s common sense, on one level, but in a country that’s supposed to be governed by laws above men, it’s disturbing – and certainly worth talking about. Ironically, the very fact that the president himself has begun to promise more congressional oversight and transparency may make it more acceptable, among his supporters, for other politicians to demand it.